Evaptainers is an electricity-free mobile evaporative cooling refrigeration technology to keep food fresh longer using only sun and water. They sell their products to the farmers in Morocco. The company was founded by Spencer Taylor and Quang Troung, who are serial social entrepreneurs. The Mentor Capital Network interviewed Spencer Taylor Co-founder and CEO of Evaptainers, an MCN Alumnus from 2014. 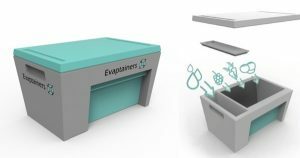 Evaptainers’ mission is to provide affordable refrigeration solutions to address the unique needs and challenges of transporting produce in developing markets. Evaptainers solves a huge problem in the food production infrastructure of developing markets by intersecting modern design, materials, and production with time tested evaporative cooling technology to create an effective, scalable, electricity free, mobile refrigeration solution. During the interview conducted on April 21st 2016, Spencer discussed with us the journey of growing this classroom idea to a sustainable business, the hurdles they overcame and their future plans of expanding internationally. Tell me about the Evaptainers model and what makes it unique. To do that I have to go back to the founding story, and my co-founder Quang Truong, who has worked all over the world in agricultural development projects. He was in a class at MIT called development ventures; in the class the professor challenged the students to come up with an idea that would change the lives of one billion people. Quang remembered a pervasive problem that he saw during his work, which was post-harvest spoil, and the waste between the field and consumer. In his work he had seen the ‘pot and pot cooler’ a brilliant evaporative cooling device designed by a Nigerian school teacher in the 1980s. However, it was not adopted outside a small province in Nigeria, the reasons were that it was heavy, had a low capacity for weight and high chances of consumer error. That’s really what Evaptainers is all about; a company dedicated to using technology to make this product lighter, cheaper and more efficient. We were very lucky being from the Boston area, which has a great startup ecosystem, and incredible resources. We are currently working out of a space called the Artisan’s Asylum and it has all the tools we could hope for. We’ve been through a number of programs and have gone through so many prototypes it helped us to run a pilot in Morocco, which is where we did our user field test. How would you describe Evaptianers’ growth over the past couple of years? What factors influenced your growth? I would say it’s has been lean and scrappy. Since 2013 we have been operating on very small budget, and this has impacted a lot of our decisions on design, production, and human resources, and even the sacrifices as founders we’ve had to make. Finding funds for an early hardware company is hard because the arc to get to the market is long, especially when you sell at a relatively low price. What successes do you want to share with us? During the first year we were self-funded and mostly paid out-of-pocket, so it’s been hard and that’s why we are really happy about the recognition we have been getting over the past six months. We won the Grand Energy National Geographic award, we’ve been sponsored by 3M Sustainability, and we have been recently awarded by Mass Clean Energy. Finally, we have been awarded a Stage 1 grant from the US Agency for International Development through their Development Innovation Ventures, which is pretty much the gold star for development work. What this grant will do is allow us to do is take feedback from our first user trial in Morocco and further develop the product. We will also have more of a compelling pitch for the Venture Capitalists and Angel Investors out there. What were the hardest parts of getting Evaptainers up and running? Engineering the product and improving it was definitely a challenge, and like I said earlier funding was hard before the recent grants, as we were operating on basically nothing. Another issue with the funding is that we are selling a relatively inexpensive product that we want to sell to a vulnerable population, so we aren’t making thousands of dollars. This delayed our revenue generation and commercial launch. Now that you are getting funding what is your next step? Well we piloted in Morocco and we will continue our sales focus there for now there are several reasons for that. Firstly, the nature of our product means we need hot and dry weather. Another reason we are focusing on Morocco is because it is a small and manageable market. Also our marketing director is Moroccan, in fact he recently won the Startup Maroc Pitch competition in Columbia, that was very good visibility for us. What is the impact you hope to have? Well this all comes down to taking Evaptainers from an idea to a reality. 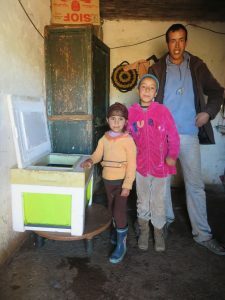 When we gave the product to families in rural Morocco and came back after a few months we saw just how much we were able to help them. The families were now saving 5 percent of their income by reducing spoilage. Moreover, families didn’t have to go into town twice a week to buy food, so transportation costs were cut and food security was improved. There are a lot of people out there doing alternate refrigeration, but what makes us unique is that we target very vulnerable populations. Evaptainers started at Massachusetts Institute of Technology in a classroom. What plans do you have for Evaptainers in the future? We want to move into Nigeria and build a scalable model that we can replicate in several markets, fulfilling the challenge of that professor to impact 1 billion people. At a micro level I would say we want to free time for vulnerable populations to do other things rather than waste it sourcing food. On a macro level we hope to be able to impact how the rural food system works. How has participating in the MCN’s program helped you? Firstly, getting feedback from experts, this was very useful. The best part for me was attending the Annual Gathering at the United Nations in New York. We met with other social entrepreneurs who were working with similar models but in noncompetitive markets and getting feedback from them and how they overcame their challenges was amazing. We organically formed working group in those meetings, we are still in touch and ask each other for help all the time. Another reason the MCN has been helpful to me and it’s actually the reason I applied to the program was because you were the first clients to my first startup called Launcht. The MCN used it as its crowd funding platform for several years. The MCN has been valuable in many ways so thank you! Learn more about Evaptainers on their website.